Just wondering, why is this set GPL and the 48x48 version public domain? Would love to see this licensed CC0 or CC-BY. Curt: "Just wondering, why is this set GPL and the 48x48 version public domain?" Much thanks! I didn't mean to sound demanding, I was just curious. I'd hate to see good art go unused, if people weren't using GPL in their games. 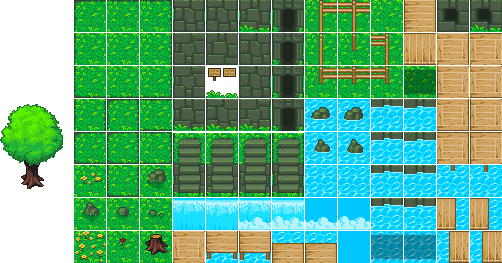 Awesome tileset! Awesome stuff. Good tones for the colours used. Animated environments are hard to come by. It's too detailed for use in what I'm working on ATM, but someone will find a use for quality stuff like this. By tall grass and bolders, do you mean independant objects, or pure tiles? The tall grass would make sense as a tile, but the boulder should be independant, like the tree. I think some of the other things should be separated into their own objects too, like the small rocks in the ground, tree stump, flowers, etc. ATM they are a part of the 'center' grass tile, and look odd if used on a border. See attached image. 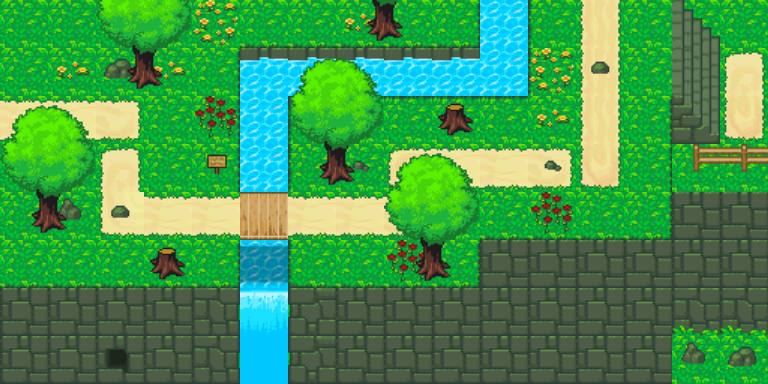 Being able to mix and match different objects with different background tiles makes each one a lot more versatile. 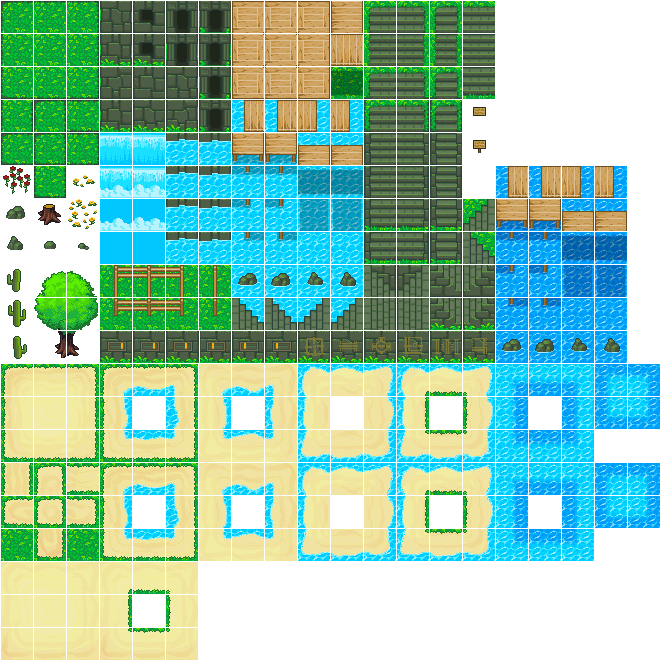 Ideally the tree should also be broken up into separate tiles with 1px spacing for consistency with the rest of the tileset. EDIT: NVM I didn't realise it has been updated. Amazing work! 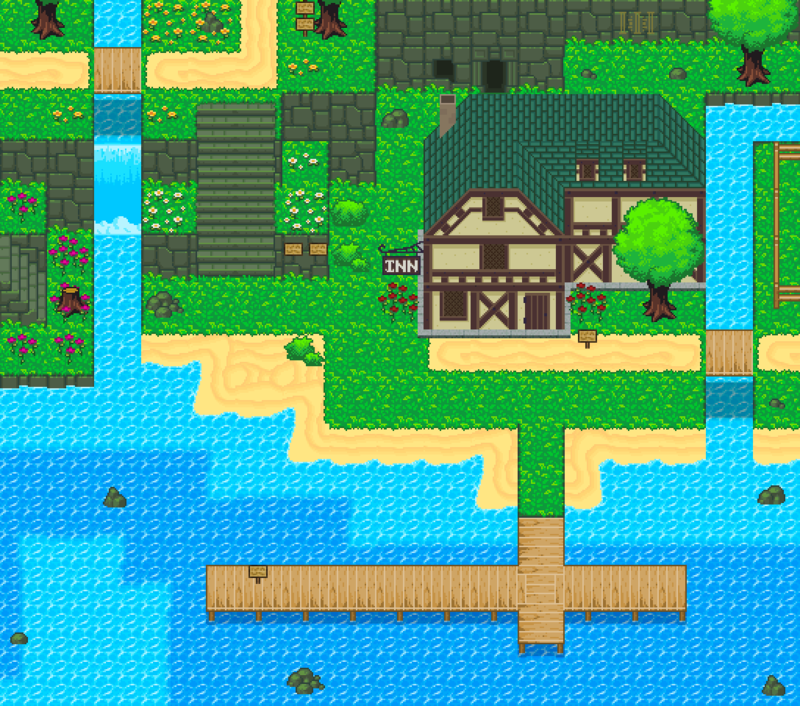 i am going to make a RPG game and these tiles will be very useful ;) !! 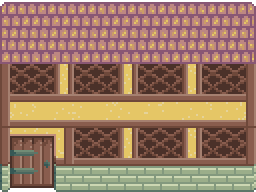 I'm actually working on RPG style building tiles. Great work on v1.2. The whole thing looks more polished and easy to use. I could just drag and drop it into Tiled and it all worked perfectly. Get known for making things as good as this and you will start attracting real job offers I'm sure. I don't know when it has been updated, so I check this page regularly. Making a quick 'Updated!' post in the comments would send an email to everyone who has comment follow-up notification e-mails enabled (I think it is by default), and put you back into the active forum topics section. I don't know if this practice is frowned upon here, but this stuff is too good not to. Some of the new tiles have allignment issues, but nothing that can't be worked around. The new modular objects are by far better. So useful to be able to mix and merge/overlay different object combinations. 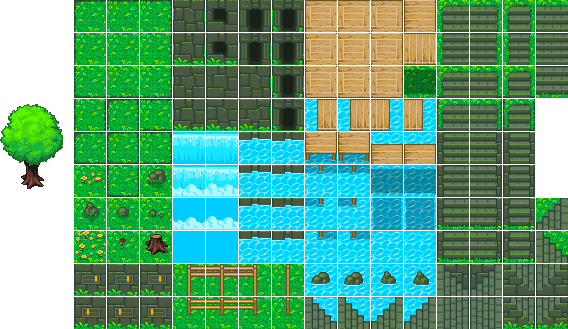 Relaly helps break up that strict 'grid' feeling that tile based games have. 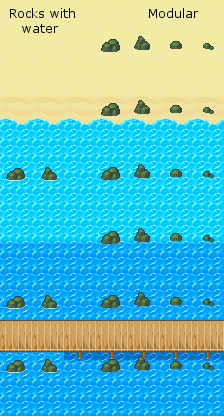 I would even recommend removing the rocks in water tiles as the same effect can be achieved with the new componential rocks, and there are is more variety. The fence sections could benefit from have the backgrounds remove too. Can't use on sand ATM. 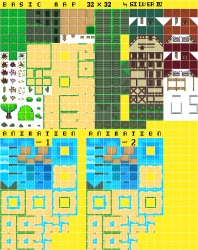 I 'll update the tiles with what Arcanorum advised me, i hope tomorow. Wow. Rock on dude. This is quickly becoming one of the best 2D art pieces on this site. I have found myself in dire need of some kind of dirt path to guide players with. I have been recolouring the sand paths to more of a brownish colour, which sort of works. The buildings look similar to some that I have been working on. 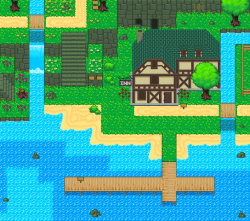 I have basically took http://opengameart.org/content/isometric-medieval-city-sim-assets and tried to make them orthogonal. Looks ok I guess, though I have some alignment isues, and I need to give them some shading. I might do the rest of the original set and put them on OGA. My game characters are kind of wide so I had to make the door wider. 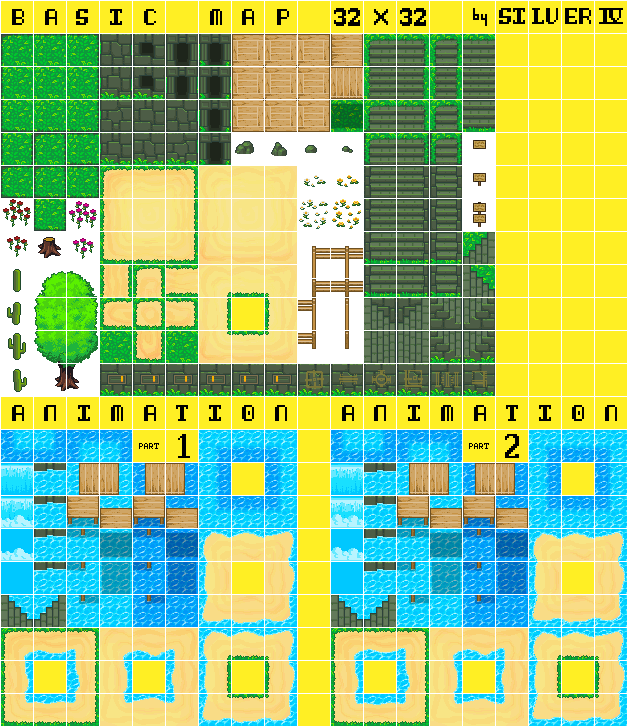 I'm working on the the hedge and tall grass you've been asking earlier. 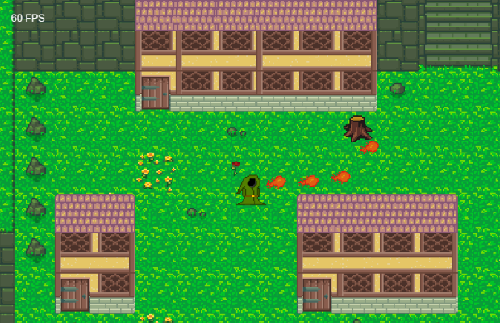 I'll add larger doors if you want, and I could work on your tiles to include them in the style. 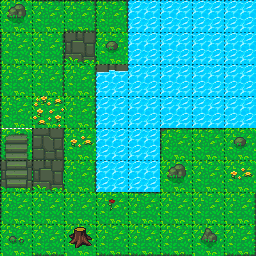 I'm using your tileset a lot in a game I'm making. I've used your stone HUD too. Wow I want to play this game! Great work! Really great stuff, very usable! Thank you very much for this. I have a noob question (sorry). There are multiple licenses associated with this. I do not know how to select one. Am I free to choose? Must I choose the most permissive or the most restrictive? Any advice is appreciated. Thank you again. Beautiful artwork. @MedicineStorm: that was perfectly helpful, thank you.